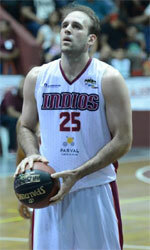 Centro Deportivo Rivadavia de Mendoza (La Liga Argentina) signed American forward Charlie Wilson (203-104kg). He just graduated from Union University, TN (NCAA2). Wilson has played there for the last three years. Wilson was voted ACCC All-South Division 2nd Team back in 2015 at his college time.